Dubai: The UAE’s Asian champion Alia Saeed Mohammad will embark to the next stage of her running career as she switches to long distance with the marathon at the 2020 Tokyo Olympic Games in mind. The 27-year-old Alia, who last major achievement was the 10,000m gold medal at the 2014 Incheon Asian Games, has stuck to the 1,500m, 3,000m, 5,000m and 10,000m since switching allegiance to the UAE from her native Ethiopia in 2010. She has gone on to win several accolades alongside that gold medal in South Korea with the most recent among these being the golden double in 5,000m and 10,000m at the 2017 Arab Championships in Rades, Tunisia. However, earlier this year Alia clocked a quick time of 1 hour, 5.13 minutes at the RAK Half Marathon making the Board of Directors at the UAE Athletics Federation (UAE AF) look at a new dimension for the athlete. “The course for the RAK Half Marathon is one of the fastest in the world. And considering that she clocked such a fast time we thought it would be better to explore the possibility of Alia starting off with a classical training to try and qualify in the marathon for the 2020 Tokyo Games,” Ahmad Al Kamali, IAAF Council Member and President of UAE AF, told Gulf News. Even though the men’s marathon is the only road running event present on the programme since 1896, it was not until nearly 90 years later that the women’s event was added at the 1984 Games in Barcelona. Since then, Japan and Ethiopia have both won two golds each, while Kenya is third with a gold and three silver medals. The Olympic record in the women’s marathon stands in the name of Tiki Gelana after the Kenyan ran a quick time of 2:23.07 at the 2012 London Olympic Games. “The reasoning behind our decision is quite simple, and based on the promise and potential shown by our athlete over a period of time. If we go by her timing in Ras Al Khaimah then we can easily have her clock somewhere in the 2.21 or 2.22 hours in the marathon. That would be good enough for a medal as things stand,” Al Kamali noted. 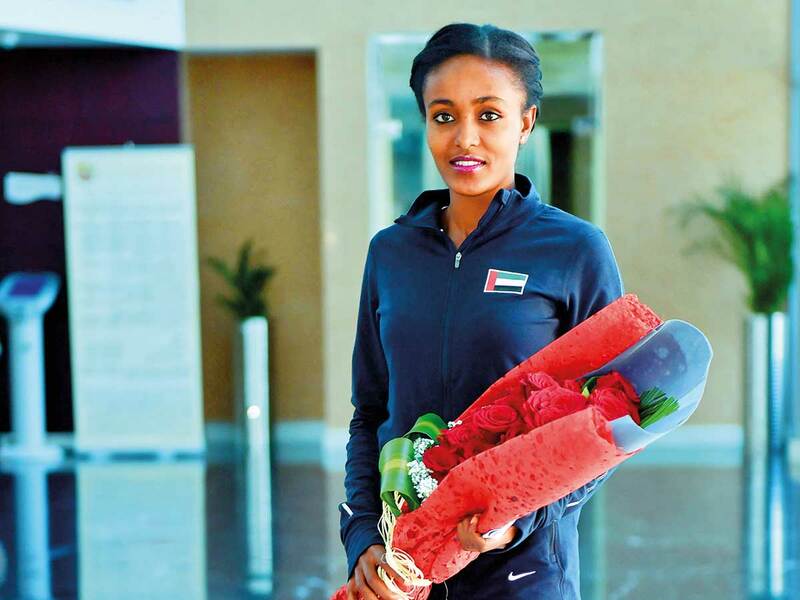 Alia has already commenced intensive training at the UAE base in Addis Ababa with an eye on the marathon at the 2020 Tokyo Games. But before that, she will participate in traditional track events such as the 23rd Asian Athletics Championships (April 21-24) followed by the 17th IAAF World Athletics Championships (September 27-October 6) at the renovated multi-purpose Khalifa International Stadium in neighbouring Doha. “That’s going to be the specific preparatory programme for Alia from now on. She will use every opportunity she gets to participate in track events for the sake of working on her speed. The Asian and World Championships will surely be among her more important stops,” Al Kamali related. “And for sure she will be expected to be gunning for the top spot when she debuts at the 2020 Dubai Marathon (on January 24). I think, and we all think, that she has the true potential to deliver once again,” he added. While her gold medal at the 2014 Incheon Asian Games would stand as a career highlight, Alia has not exactly bloomed on the international stage. She missed out on a podium after finishing fourth in a time of 15:52.07 in the 5,000m at the 2011 IAAF World Athletics Championships Daegu, South Korea and four years later, she failed to finish the 10,000m in Beijing. Touted as one of the medallists for the UAE, Alia finished 23rd with a time of 32:16.97 in the 10,000m at the 2016 Rio de Janeiro. Last year, Alia failed to successfully defend her gold medal at the 2018 Jakarta Asian Games while finishing fourth in a time of 32:18.32. Her attempt to redeem herself in the 5,000m failed as Alia ended in ninth with a time of 16:09.49. “She’s next headed to Denmark and then return to Cairo for events that are meant to get her race prepared before she begins her qualifying process for Tokyo 2020. We can only hope her progress goes as per the plan set for her,” Al Kamali said. The UAE squad for this month’s 23rd Asian Athletics Championships will consist of four athletes, including Mayouf Hassan [800m], Saud Al Za’abi [1,500m], Fatima Al Hossani [Discus throw] and Alia who is expected to run in the 5,000m and 10,000m.